A general language for transforming raw text files from one format (and/or encoding) to another. The input files do not have to be XML documents. The output files do not have to be XML documents (though often they will be). When you dream of software regularly, it's a bit of a worry. Anyhow, this is an idea I had while mowing the lawn today. I think it could really speed things up interconnecting legacy systems with the XML-aware world. What do you think? XPLT borrows from XSLT and Regular Expressions (RE), but also provides a more human-readable style of Pattern-Matching, encapsulated within the Pattern element. Patterns are combined with templates and flow control semantics, that allow for very flexible document transformations. XPL Transformers could be written on any platform, for any technology. Collections of specific and re-usable XPL documents for converting between any two text-formats could be shared and distributed. Here are some typical scenarios for which XPLT is useful. A legacy system produces CSV documents. They can be converted to XML using XPLT. A trading partner produces XML documents that are not always well-formed. They can be 'pre-processed' with XPLT to produce well-formed XML. A HTML doc needs to be parsed to retrieve certain values. HTML code includes embedded font tags. It needs to be altered to use CSS. Wiki Text needs to be converted to xHTML. These problems can be solved by writing custom parsers, or, at best, through clever use of Regular Expressions. Maintenance of such code can prove remarkably expensive. Why? System boundaries are *always* in a state of flux. Custom parsing is notoriously buggy -- even if it runs error-free for six months, you know there is a chance that an unexpected character combination could upset it. Regular Expressions are deliberately terse. This limits the number of developers who take the time to master them. The platform and underlying technology of a system boundary can change. Any platform or technology dependent code then needs to be rewritten completely. In XSLT, the 'Match' and 'Select' attributes reference an Xpath expression. 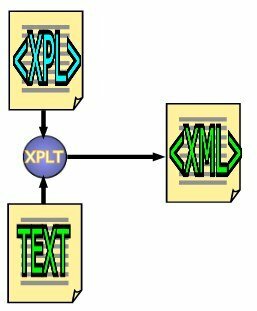 In XPLT the equivalent attributes reference a named Pattern element. Any such pattern can also be expanded using the far more verbose pattern semantics of XPLT. I guess you would also have 'greedy' and/or 'non-greedy' attributes. Here's the original picture I came up with -- the complete loop converting proprietary text into XML by using XPLT. Then converting the XML back into properietary text, by way of XSLT. I'm damn tired now -- so i'll stop there. Cheers! A language for writing compilers. A scripting language for the Note Bene word processor. A MIDI programming language for Amiga. A language called eXtensible Programming Language. A Pascal-like language named XPL0.